The only kickstand pad always at your fingertips! KP-1: The new KP-1 may just keep your bike from falling when over shaky ground and stores neatly inside the HD floorboard. It's handy, fast and convenient. Plastic injection molded to a perfect fit with your stock floorboard. 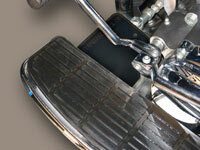 Simply slip between the rubber pad and steel frame of your floorboard for easy and convenient storage! Aproximately 8-1/2" x 4". 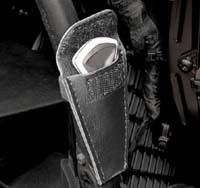 HK-1: A great little pouch to hide an extra key on your bike and keep it clean and ready to use should the need arise. A 6’’ hook and loop strap provides a secure fit that will not give way, even under the harshest conditions. The pouch is3 ½’’ in length and 2 ¼’’ in width to easily accommodate the largest key we could find. Made from weather resistant marine vinyl. Universal use and made in the USA.